"...July 23, 1917: Mr. Pasternack [Josef A. Pasternack 1880-1940, Musical Director of Victor] assembled an orchestra consisting of 51 musicians. The rooms in the general Recording Laboratory not being large enough to carry on this work, we were permitted to use the Auditorium on the eighth floor of the Executive Building. Up until this time, Symphony Orchestra records had never been a success [for Victor], but it had always been one of our greatest ambitions, and with the untiring efforts of Mr. Pasternack on the above date, we felt we had a commercial Symphony Orchestra record, but at that time, the largest orchestra we could satisfactorily record consisted of about fifty musicians. So, for the first Victor recordings of a full symphony orchestra in October, 1917, first the Boston Symphony Orchestra under Karl Muck were followed by the Philadelphia Orchestra conducted by Leopold Stokowski. Further is written about the Muck - BSO recordings later in this web page. On Monday, 22 October 1917, Leopold Stokowski and the Philadelphia Orchestra boarded a ferryboat taking them from Philadelphia, across the Delaware river to Camden, New Jersey. They went to Camden because this was the home of the Victor Talking Machine Company, built and controlled by Eldridge R. Johnson, a key innovator in the phonograph industry. Victor had asked Stokowski to record as early as 1915 3. Although the Monday first recording sessions were not successful, the Orchestra returned to Camden on Wednesday, October 24 to produce its first two released phonograph recordings. With there first 1917 recordings, Stokowski and the Philadelphia Orchestra began an historic collaboration which over the next 9 years released approximately 67 acoustic 78 RPM Victrola sides of remarkable quality, given the available technology. 1917 Philadelphia Orchestra Recordings Eighth floor Auditorium - Victor Office Building The 1917 recordings were made in the eighth floor auditorium of the New Office Building number 2, the Victor Company's executive headquarters building which had been constructed in the previous year. 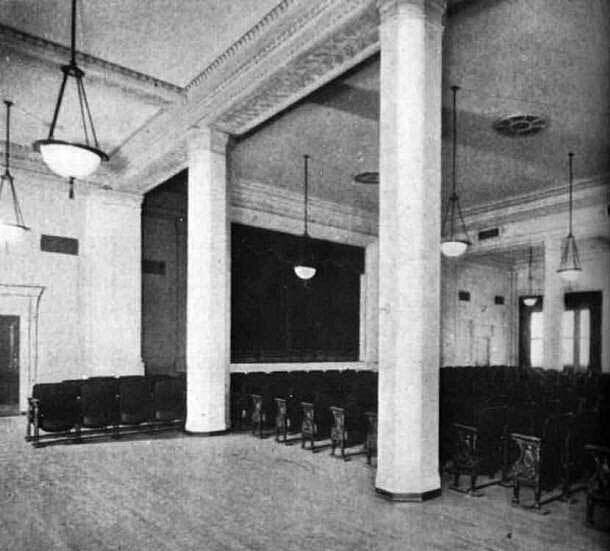 Early in 1917, this large eighth floor auditorium had also been used for the famous Caruso, De Luca, Journet, Galli-Curci, Bada, and Egener sextet recording of the mad scene from Lucia Di Lammermoor (Victor Red Seal 95212). Also, a little more than two weeks prior to the Philadelphia Orchestra session, from 2-6 October, Karl Muck and the Boston Symphony Orchestra had spent a week in Camden making a very fine series of acoustic recordings in this same auditorium. Also, earlier certain other American orchestras had recorded. In January 1917, the Cincinnati Symphony under their Music Director, Ernst Kunwald (1868-1939), who was Stokowski's successor at the Cincinnati Symphony, recorded Delibes and Halvorsen for Columbia Graphophone (Columbia A 5943). Even earlier, Frederick Stock, Music Director of the Chicago Symphony, recorded Mendelssohn's Wedding March from 'A Midsummer Night's Dream' for Columbia Graphophone on May 1, 1916 (Columbia A-5844 matrix 48763) 4, with Grieg's 'To Spring' on the other side. 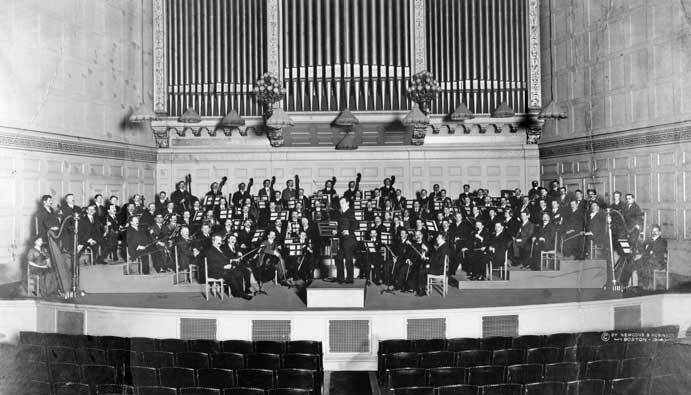 This Chicago recording may have been the first U.S. orchestra to record under its permanent conductor. And of course, there are the famous Artur Nikisch recordings of Egmont and Oberon Overtures were made 25 June 1913 in the UK, and the famous Beethoven Fifth with Berlin Philharmonic of 20 November 1913. However, one important difference between the Victor recordings of Karl Muck - Boston Symphony and Stokowski - Philadelphia Orchestra compared with the previous recordings of the Cincinnati, Chicago, Colonne, Nikisch and other orchestra recordings s was that the Muck and Stokowski recordings were of the full symphony orchestras of between 85 and 100 players. The earlier recordings were of reduced forces of perhaps 35 to 40 musicians. This is probably the reason that RCA Victor in its 2001 commemorative album "RCA Red Seal Century" (RCA 63861), RCA claims that the Karl Muck recording of 5 October 1917 was "...the first known commercial recording sessions with a full symphony orchestra...". A recent reviewer of the 1917 recordings states '...One source claims that 90 Philadelphia Orchestra players made it under the horn. I simply do not believe it...'. The reviewer gives his opinion and explains why. However, the excellent Encyclopedic Discography of Victor Recordings (EDVR) maintained by the University of California, Santa Barbara provides the documented information from the Victor ledgers 5. So, with a few internet clicks, opinion is not required. There were in fact 93 musicians: 16 first violins, 15 second violins, 12 violas, 10 celli, 8 double basses, 3 flutes, piccolo, 4 oboes, 4 clarinets, 4 bassoons, 5 horns, 4 trumpets, 3 trombones, 1 tuba, 1 timpani, and 2 percussion. By the time of Stokowski's 1919 orchestral recordings, the recording location (called by the Victor engineers the "recording laboratory") was moved to Building no 22, the Camden Church Studio. 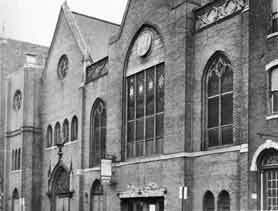 This was also called the 'Trinity Church Studio', since the building was converted from the former Trinity Baptist church, adjoining the Victor buildings and purchased by Victor in 1918. (Click here to read about Camden Church Studio - Victor Talking Machine Recording Location ). In Sound Recording: The Life Story of a Technology by David L. Morton Jr. 7, Morton states that Victor prior to the 1930s usually located recording studios on higher floors so that the recording mechanism could be powered by weights. During this period, prior to the 1930s when electric motors were developed that were both quiet and consistent in speed, the use of weights was preferred to drive the disk recording mechanism at a constant speed and with low vibration levels. Weights were also more constant in speed that spring driven motors. Click here to read about the development of the acoustic or 'mechanical' disk recording process . These first two recordings were of the Brahms Hungarian Dances numbers 5 and 6, both in orchestrations by Albert Parlow, the originals being for piano four hands. Although orchestrations, these were not among the early Stokowski orchestrations of non-orchestral works for which he later became famous. Rather, the Brahms Hungarian Dances were a regular part of the concert repertoire in Philadelphia and of orchestras elsewhere, and had been recorded since the earliest days of recording. These two Brahms recordings were released by Victor in 1918 on two single-sided 10 inch (25 cm) Victor Red Seal disks as Victor 64752 for the Brahms Hungarian Dance no 5 and Victor 64753 for Hungarian Dance no 6, matrix numbers B-20888-3 and B-20889-3. According to the Robert M. Stumpf II excellent Stokowski concert registry 6, Stokowski does not seem to have played these pieces in concert since at least 1913. Also, it is striking that Stokowski never made any other commercial recording of these two Brahms works with any orchestra over the next sixty years of prolific recording activities. It is interesting to contrast this first Stokowski recording of the Brahms Hungarian Dance no 5 with the very early Pathé recording of this work by Édouard Colonne, conducting his orchestra, l'Orchestre Colonne. Colonne was born in 1838 (when Chopin and Rossini for example were still active), and was therefore nearly 44 years older than Leopold Stokowski. 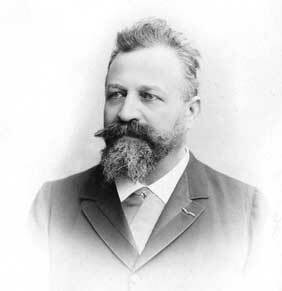 Compared with his older Parisian colleagues, Jules Pasdeloup and Charles Lamoureux, Édouard Colonne is said to have had a less well developed conducting technique, but he had passion and power that Pasdeloup in particular was said to lack. From his stature and reputation, he seems to have been the earliest eminent conductor to have recorded disks which are available to posterity. He was also the earliest born. It is also interesting that Stokowski made his conducting debut with the Colonne Orchestra in May 1909, only two or three years after Édouard Colonne and his orchestra made this Brahms recording. Click on the link below to hear this 1906 version of the Brahms Hungarian Dance no 5. Compare the result with the full Philadelphia Orchestra, recorded 11 years later. Note that the voice introduction of the recording, customary in the earliest acoustics, identifies the piece as being Brahms Hungarian Dance "number 1". The same day as the recording of the Brahms Hungarian Dance no 5 in G minor on October 24, 1917, Stokowski and the Philadelphia Orchestra they recorded the Brahms Hungarian Dance no 6 in D Major (also as orchestrated by Parlow). It was also issued on a single sided Victor Red Seal 10 inch disk, catalogue number 64753. The matrix number was B20889-2. Click below to listen to this second recording by Leopold Stokowski and the Philadelphia Orchestra. Although the Hungarian Dance no 5, and the Hungarian Dance no 6 seem to be the only commercial recordings of either work by Stokowski with any orchestra, Stokowski recorded the Hungarian Dance no 1 at least six times, the last time in 1975, more than 53 years after this first Stokowski recording. Following these first two Stokowski recordings with the Philadelphia Orchestra, they made further recordings later in 1917 in this same Eighth Floor Auditorium of Victor Building no 2, before moving to the Camden Church Studio in 1919. 2 Sooy, Raymond R. Memoirs of my Recording and Traveling Experiences for the Victor Talking Machine Company. Op. Cit.